Whenever you play a massive RPG, you normally find yourself playing as the hero of the hour causing destruction, burning down towns, fighting a huge battle and causing mayhem with dragons. But have you ever thought about the little people who have to clean up after you? The poor street cleaners? The builders? The fire department? The insurance claimers? What about the place you buy all your fancy equipment for the adventure ahead from? Have you thought about how hard it is to get that equipment for you to buy? Or what it is like to be an honest retailer in a world of magic, monsters, and barbarians? The developers of Shoppe Keep have and they’ve built a whole game around it. But is it a Level 10 flaming broadsword or a small pair of worn out leather shoes? 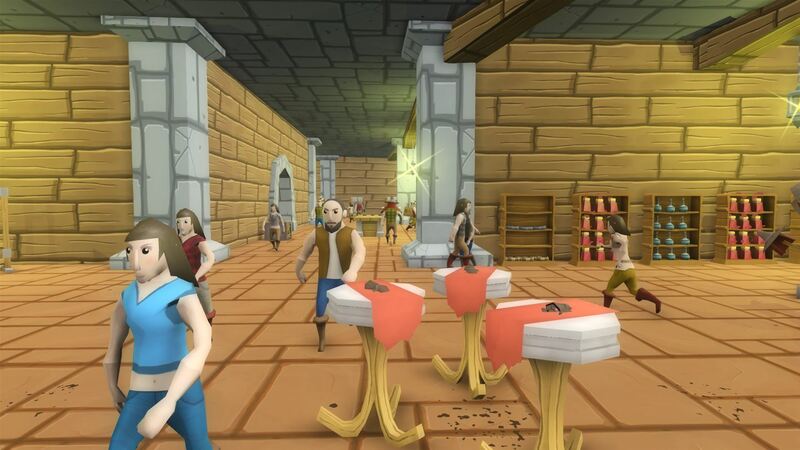 Shoppe Keep is a shopping sim placed in an RPG fantasy setting. You take control of a shop and have to buy stock, before furnishing said shop and enticing customers in to become the Marks and Spencers of the ancient world. You start the game with a small empty room, a storeroom out the back and lots of potential. But you only have a small amount of gold, so it is important for you to use that money wisely. The main guy found in Shoppe Keep is, of course, your shopkeeper. You can customize them till your heart’s content, and with a touch of the Y button, you are able to bring up a menu which lets you do a number of things straight away. 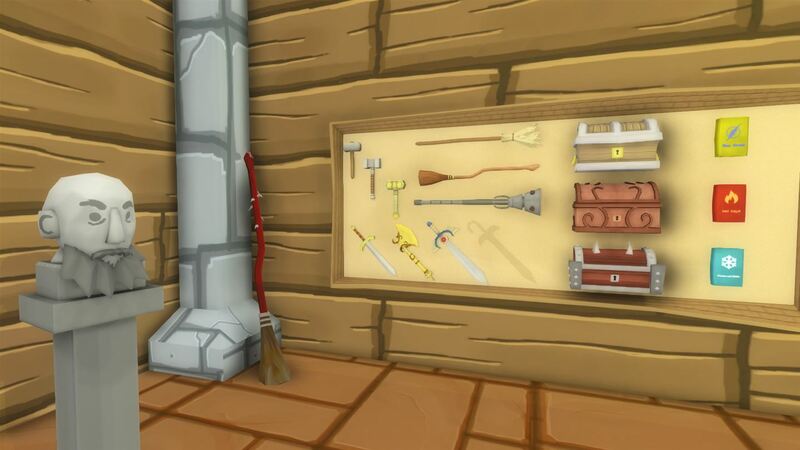 A build option lets you select a range of fixtures and fittings for around the shop – you’ll want to start off simple with a pair of pedestals, but soon you’ll be buying armor racks, decorative items and extensions for your retail empire. You also have to keep the shop tidy – actioned via a sweeping button – and will need to start repairing if your fixtures start to look a bit shabby. Then through the menu bars, you have an inventory menu where you can order your stock and put each piece out on the shop floor, remembering to take care deciding on how much you’ll be selling each item for and how much profit you want to make. Leave too much of a gap on the margins and you’ll lose customers; too little and it will take ages to make some dollar. Enticing the customers into the shop could well be your biggest problem and the first in-game week is the toughest. Waiting in silence as you watch people walking by the entrance of the shop unimpressed is something you will have to get used to, so much so that you may have to venture out on to the street with your goods and try to sell them face to face. The more stuff you sell, the more you level up, unlocking further shop treats as you go. 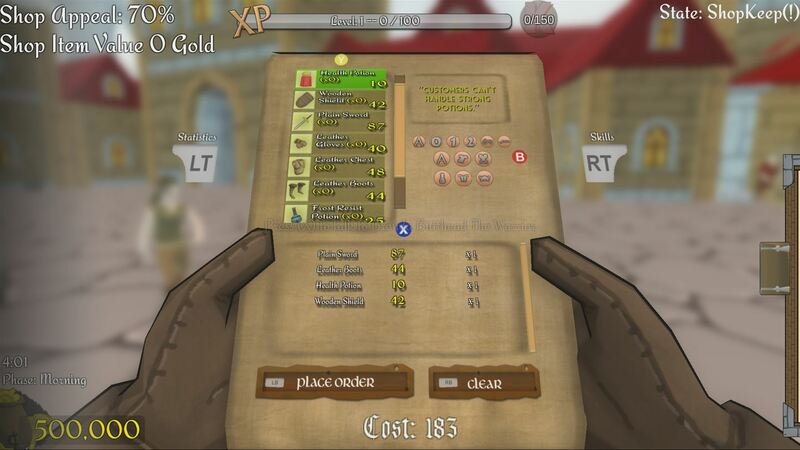 There are quests to take part in which will require you to sell a certain number of items. These bring experience points and a bit of focus on what you should be selling. Every now and then – as with all good shops in this day and age – a thief will run away with your wares or barbarian hordes will stop by looking to cause havoc. You needn’t worry though because you are the best-equipped defense shopkeeper in the world – a sword or magical attack will wipe out any crime. You may like to then leave the dead bodies outside as a warning to other would-be shoplifters. Shoppe Keep all works well enough, even though the controls can be a pain to get used to and there are more than a few glitches. Even with the number of hours I’ve put in, I still find myself pressing the wrong button and getting confused with the menus. And whilst on the whole the transition from PC to console has worked, it’s not a completely smooth shop keeping journey. You see, sometimes when there is no one coming into the shop, you’ll save progress and switch off, only to find that on the next load it’s as busy as Christmas Eve in central London. Or occasionally all the stock will disappear, except for a single potion. But the game is very addictive and very moreish. In fact, you can’t stop playing when you get a whiff of the cold hard cash of a customer, and the promise of being the best shopkeeper in the land. Visually though and Shoppe Keep looks like an early 1990s’ Amiga title. It’s all about blocky 3D pixels and animations. That’s fine though and you get used to it very quickly, for it’s not a game about looks, it’s all about shopping. In the sound department the game has an epic RPG soundtrack – one that is so epic that it will begin to grate after a few hours, so turn it off and put your own shop themed playlist on. I have become very addicted to Shoppe Keep and it will be very hard to stop playing. It has a completely original concept, delivers a great bit of sim-based fun and comes with some wonderful ideas. But the controls can be tricky, and there are glitches that are occasionally annoying; it is these which are key to how much time you’ll invest in this game. But for now, I will bid you farewell as I’ve got an order of leather boots that I’ve got to sign for.